A new 2006 Sandia Report reveals that a flammable LNG vapor cloud could extend 7.3 miles - warns consumer protection advocates Tim Riley and Hayden Riley, producers of film: THE RISKS AND DANGER OF LNG available at LngDanger.com. In March 2005, the U.S. Coast Guard requested that Sandia National Laboratories review the ‘Independent Risk Assessment of the Proposed Cabrillo Port LNG Deepwater Port Project’ off the coast of Malibu, California. SUMMARY: A flammable liquefied natural gas (LNG) vapor cloud could extend 7.3 miles. According to the newest Sandia Report, based upon the worst credible intentional or accidental event release of 53 million gallons (200,000 m3) from two tanks of LNG, it was determined that a wind speed of 2 m/s (4.5 mph) resulted in the ‘worst case’ in which the flammable vapor cloud extended about 7.3 miles (6.3 Nautical Miles or 11.7 km) downwind from the proposed offshore LNG Floating Storage and Regasification Unit. Consumer protection advocates and filmmakers Tim Riley and Hayden Riley, producers of the LNG documentary film The Risks and Danger of LNG, are very concerned about the ever-changing ‘worst case’ scenarios for LNG spills. “This new Sandia 7 mile ‘worst case’ scenario is even more frightening than their earlier ‘worst case’ reported in December of 2004, which determined an offshore flammable LNG vapor cloud could extend approximately 2 miles,” said co-producer Tim Riley. In their film, The Risks and Danger of LNG, the Riley’s provide a vivid and riveting counter-point to the LNG industry safety claims by exposing the documented hazards of LNG. They point out the unreliability and inconsistency of LNG computer modeling, and urge the federal government to conduct large-scale offshore LNG spill tests. “Until these tests are performed and fully understood, the LNG approval process should be halted worldwide. This is one of the strongest messages of our documentary film,” said Tim Riley who also co-wrote the compelling movie. “We are very concerned that the LNG approval process, absent the necessary large-scale LNG spill tests, is placing unwary communities at substantial risk. This country does not need another disaster – especially one that is man made that could be prevented if our energy policy ‘visionaries’ would take their heads out of the sand,” added co-writer Hayden Riley. 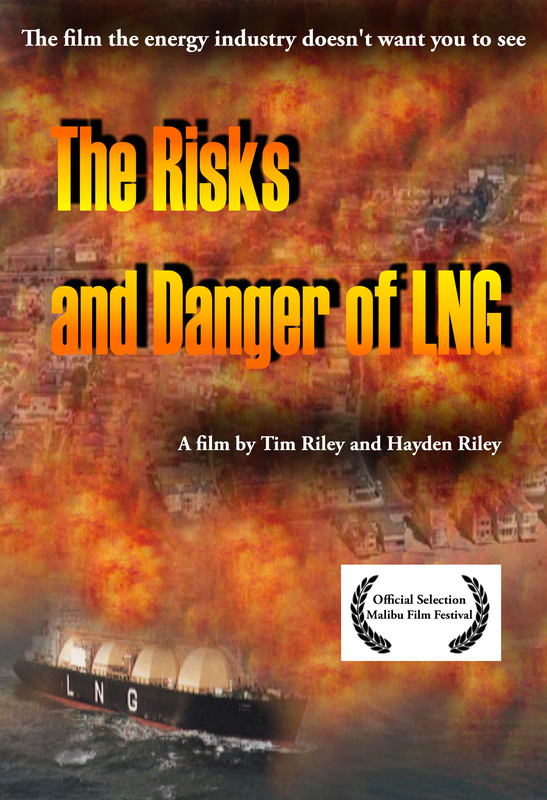 To preview and buy a DVD copy of the LNG documentary film, The Risks and Danger of LNG, an Official Selection of the Malibu Film Festival, visit http://LngDanger.com. DVD: THE RISKS AND DANGER OF LNGThis is the film the energy industry doesn't want you to see.